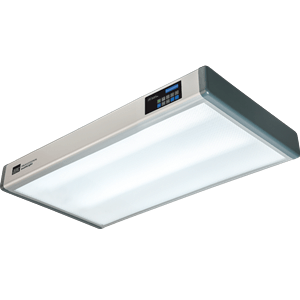 Be it in daily life or in manufacturing industries, in retail or in the private sector, many different light sources are in use today, such as sunlight, incandescent lamps, fluorescent lamps, energy-saving variants and, more recently, LED lamps. Each of these light sources has different spectral characteristics that strongly influence the human perception of colour. If the same colour is viewed under different illuminants, the colour impression varies to different degrees. This is referred to as colour constancy. When two colour samples look identical under one illuminant, but change under another illuminant, this is known as metamerism. This occurs when the two colour samples were produced using methods that differ in one or more ways, including raw materials (e.g. inks/colourants and substrates), imaging methods (e.g. spray paint, wipe-on stains, direct inkjet printing), and finishes (air dry, UV cure, varnish or laminate overcoat, etc.). To visualise the effects of metamerism, two products or colour samples should be viewed and matched under different illuminants (at least three), ideally with identical viewing geometries and variables. The CIE illuminants D65 (average daylight from the northern sky), A (incandescent lamp), TL84/F11 (store lighting) and D50 (noon daylight) are very often used for this purpose. Metamerism is efficiently simulated with a viewing booth or luminaire equipped with multiple, switchable light sources. Within a standardised viewing area, samples should be positioned closely alongside each other to support detection of slight colour differences. 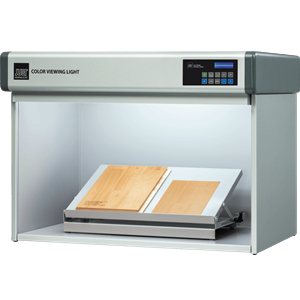 Colour changes due to optical brightening agents, security films and fluorescent products are more readily detected when the light source incorporates a switchable, additional UV-A source with a 365 nm peak wavelength. 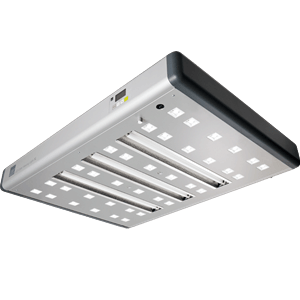 Increasingly, LED light sources are being used in general lighting, either as retrofits or in place of conventional light sources such as fluorescent, halogen or incandescent lamps. The challenge this presents is the spectral distribution of LEDs differs substantially from all other light sources and, as a result, the visual perception of colours viewed by them changes. The accurate simulation of LED viewing conditions requires LEDs, and JUST offers multiple products incorporating LED technologies that simulates both other LEDs and the standard illuminants (e.g. A, D50, D65, etc.). Viewing conditions are the net, integrated result of a system that integrates all variables of both the equipment manufacturer and the end-use application. The end-use environment variables include light mounting and dispersion geometry, age and type of light source(s), surrounding areas, ambient lighting, and even the position and clothing of the personnel using the viewing area. When we measure this system we also have variables associated with the measurement instruments. Ambient conditions, with respect to surround surfaces, have a major influence on colour assessment. Consequently, the neutral-gray viewing area in viewing booths is also defined within the standards. 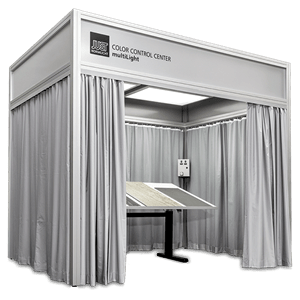 JUST Normlicht viewing booths are generally coated in Munsell N7 – but they are also available in the neutral gray shades Munsell N5 and G5574 on request.